Weinberg junior Mark Silberg presents possible Spring Quarter themes at a group meeting. SEED focuses on service and environmental advocacy. The newly elected leaders of Students for Ecological and Environmental Development unveiled their new goals for the group Tuesday evening. Silberg, a Weinberg junior, said the group’s mission is to incorporate all these issues and show how they affect the environment. The group was founded in 1968 under the name Northwestern Students for a Better Environment. To mark SEED’s 45th anniversary, Silberg and co-president Chelsea Corbin are working to turn it toward the 21st century by building an intersection among human health, social justice and the environment. 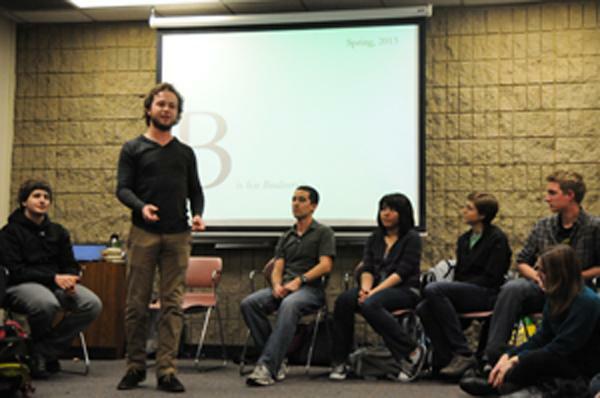 They want to involve more students with similar interests from other campus organizations. Silberg and Corbin plan to orient the group around quarterly themes that highlight its focus on programming and partnerships within and outside of the NU community. Next fall, for example, the group will focus on environmental justice. Silberg said he hopes to illuminate the fact that minorities and people of lower socioeconomic class are more vulnerable to environmental health consequences. SEED hopes to partner with groups such as the Northwestern Community Development Corps, Alianza and For Members Only to promote dialogue about race, class, the environment and how these issues are all related. The group’s previous co-president, Amanda Myers, supports the direction in which the new executive board plans to take the group. Myers said SEED has always focused on education and the quarterly themes will make the group more continuous while operating within its traditional framework. In all, the group’s new co-presidents are excited for the future.